Peace River is a community brimming with things to do. Among the many options are more than 17km of public trails in Town. Whether you’re walking yourself, walking a dog or going for a bike ride, Peace River’s trail system will keep you occupied. The west hill trail has been realigned. This is due to the changes resulting from the bridge construction on the west hill. 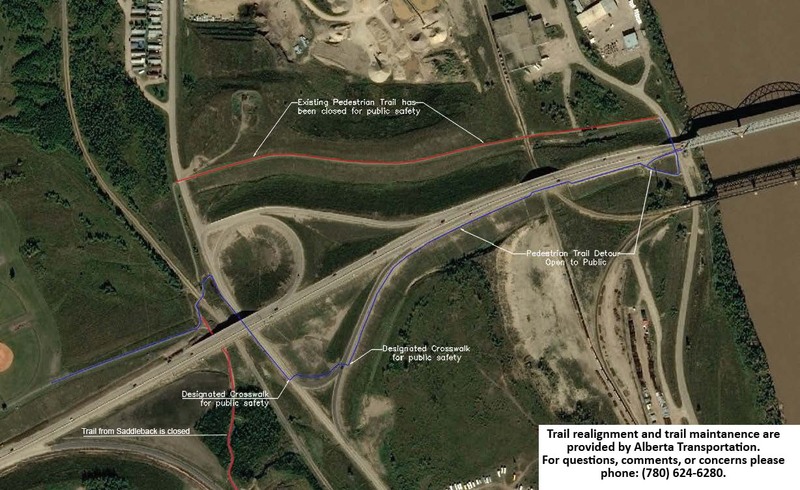 Alberta Transportation has provided us with this map outlining the changes in the trail layout. Approved by Council in 2011, the Parks and Trails Plan outlines the Towns plans and priorities regarding the many parks and trails we maintain. Throughout town, you will see large areas (over 200 acres) of nicely mowed grass just waiting to be enjoyed. These large areas are managed by the Community Services Department and maintained through a contracted service. Mon- complete green space maintenance on west side of town, including Lower West Peace and Shaftesbury but not including the large park in Saddleback and green space area outside Ken Horneland ball diamonds, complete south end dyke trail. Tues – complete all areas in south end and downtown as well as 12 ft Davis Events Park and surrounding green space. Wednesday- north end and downtown dyke as well as large field north of train tracks, soccer and football fields, start mowing north end town properties. Thursday – large park on west end (Saddleback) as well as the open green space around the Ken Horneland ball diamonds, finish mowing north end properties. Friday- Mount Pleasant Cemetery grass maintenance. Naturalization is one of the ways in which we manage our green spaces and there is merit in adopting a more ‘natural’ approach to tending and maintaining specific areas of our public green spaces. Given the topography of the Town of Peace River, with great slopes and hills, oftentimes cutting the natural prairie grasses proves harmful by encouraging soil erosion and moisture loss evaporation. Certain areas that may have been cut regularly in the past have been eliminated from the cutting schedule in order to preserve the topsoil, and to improve the safety of the grass cutting personnel. In general, those slopes that are most susceptible to soil erosion are also steep enough to be hazardous to equipment operators. The “Welcome Sign” hill on 98 St is an example of an area that the Town has naturalized. Noxious weeds can grow and spread quickly, invading crops and ecosystems, and making properties unsightly, overgrown and infested. There are a number of species that have become rampant in Peace River: Common Toad- flax, Canada Thistle and Perennial Sow Thistle. For more detailed info on noxious weeds in Alberta please download this guide produced by the Government of Alberta and Wheatland County. Canada Thistle Grows up to 1.5 metres tall with clusters of flowers, ranging in colour from purple to white, with prickly leaves. 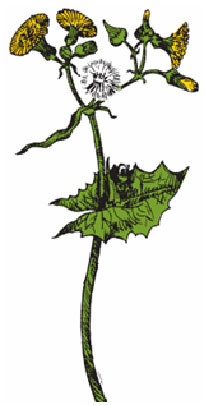 Perennial Sow Thistle Grows up to 1.5 metres tall on a sin- gle stem, branching near the top. Branches have prickly leaves and end in large, loose clusters of yellow, dandelion-like flowers. 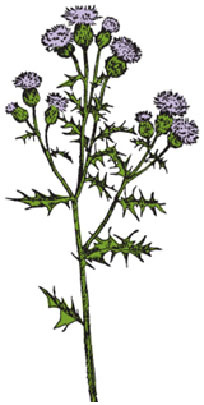 The entire plant has a milky juice, which is why it also goes by Milk Thistle. 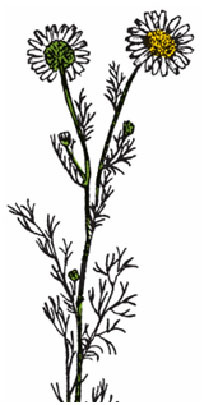 Dalmatian Toadflax The stem can be as short as 15cm or grow up to 1 metre tall. The leaves are numerous, alternate in color from pale green to gray- green, are long and narrow, pointed at both ends, with smooth edges. It has yellow, snapdragon-like flowers with orange. Scentless Chamomile Grows up to 1 metre tall with white daisy-like flowers. When crushed, leaves have no scent. You can mow your property with mowers or weed eaters to 10 cm (4″) or This will help to cut down the weeds before they go to seed, and will kill them off in a couple of years. You can also pull weeds out of the ground by hand to control small numbers, making sure that you pull the entire root out. Dispose of weeds in plastic bags to ensure that the seeds do not dry out and blow away in the wind. Keeping your lawn healthy will make it more difficult for weeds to grow or go to seed on your lawn or garden. Spraying weeds is also potentially hazardous, please consult your local greenhouse to learn about eco-friendly products and how to apply them properly. Noxious weeds on private property must be dealt with by the property owner.